« Six Arabian Nights nominated for an ENnie! Liz Courts (), a good friend of mine, has reached a milestone in her freelance career – her first solo cover credit. The book? 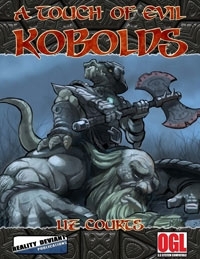 RDP’s A Touch of Evil: Kobolds. The Touch of Evil series highlights a single race, giving GMs additional background material, and a number of NPCs which can be used in play. The NPCs are presented at three different power levels, making them perfect for recurring villains. Liz was born for this project. Her work at DM Tools, for those familiar with the site, has produced a constant stream of great plug ‘n’ play NPCs. Give Liz your support – buy a copy of Kobolds today. This entry was posted on Monday, July 21st, 2008 at 19:26 and is filed under Uncategorized. You can follow any responses to this entry through the RSS 2.0 feed. You can leave a response, or trackback from your own site.